I thought it might be interesting to see what kind of official documents are available online. I looked up what’s out there in the .gov domain (arpanet site:.gov) and the first hit is a nice looking site from the NSF on the birth of the internet. I tried the same approach with military sites (arpanet site:.mil) and found the history of DARPA, and a 50 year retrospective. 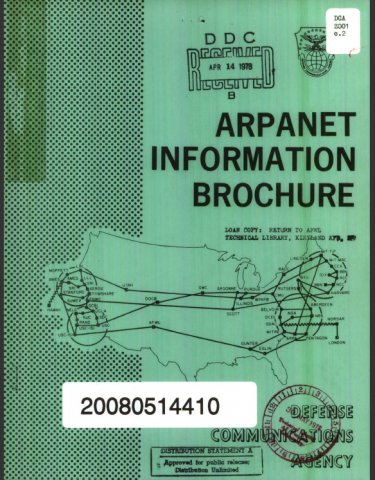 The idea that from the beginning ARPANET was a “research and development network” reinforces that from the beginning, despite visions of a failsafe communcitaions network in the event of nuclear war, this network was very much an experimental network premised on sharing resources, preventing redundancy, and re-imagining communications. MILNET, the operational military network didn’t become its own entity until 1983. Following the successful accomplishment of initial ARPANET design goals and the expansion of the network, it was considered appropriate to transfer the responsibility for operation of the ARPANET from DARPA to the Defense Communications Agency (DCA). In July 1975, the DCA became the operational manager of the ARPANET. The ARPANET is an operational, resource sharing inter-computer network linking a wide variety of computers at Defense Advanced Research Projects Agency (DARPA) sponsored research centers and other DoD and non-DoD activities in CONUS, Hawaii, Norway, and England. The ARPANET originated as a purely experimental network in late 1969 under a research and development program sponsored by DARPA to advance the state-of-the-art in computer internetting. The network was designed to provide efficient communications between heterogeneous computers so that hardware, software, and data resources could be conveniently and economically shared by a wide community of users. 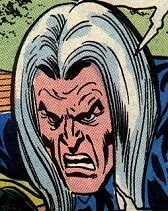 Exactly, an “experimental network …. to advance state-of-the-art in computer internetting.” The basic math that helped realize the fantastic vision of such a platform. I think it’s important to remember ARPANET wasn’t given to universities and commercial interests after all the hard work had be done—rather the work was being done by the government, universities, engineering firms, and telecoms from the very beginning. A complex series of relationships that often get lost in the historical afterglow. This entry was posted in The Internet Course and tagged arpanet, tic104. Bookmark the permalink.